With spring fast upon us, there is lots of work to be done. March is a fun-filled month full of things to do for everyone: organizers who have long anticipated spring cleaning; gardeners anxious to get their summer planting underway; families looking forward to time with loved ones during Easter; and interior designers who are ready to shed the dark, heavy fabrics of winter for something more bright and refreshing. To help get your home in the spring of things, we’ve put together a list of some of the hot interior design trends for Spring 2013. Spring 2013 interior design is heavily influenced by nature. 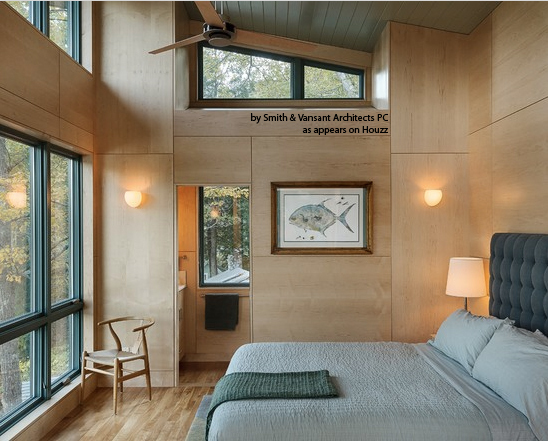 Whether it’s in the form of earth-tone colors or the use of organic building materials, more and more designers are drawing inspiration from organic design elements. Materials like rough-cut hardwood floors, slate countertops, and weathered concrete building elements are examples of this natural, contemporary design trend. You can also incorporate natural/living décor, such as wall hanging plants, to bring a more natural feel to your space. To contrast with your natural design elements, colors from the pastel palette provide the perfect pop. Check out Pantone’s 2013 fashion color trends to get a feel for the types of colors that are in season this spring. If you need help visualizing how to put the perfect color pallet together, Pantone has also compiled several complete color palettes so you can get a sense of how these colors work together. Here’s a hint for next season: pay attention to the Neiman Marcus Spring Catalog, as many of the colors featured on their clothing are trendy in the interior design world as well. Light fixtures have been prominent in interior design for the past few years, and that trend is expected to continue. Using contemporary light fixtures, or light fixtures that otherwise contrast with the rest of your room’s design, is a great way to spice up a room without having to redo everything. A lot of popular light fixtures today use the old-timey Edison bulbs, which add a cool retro feel and a warm glow to your space. 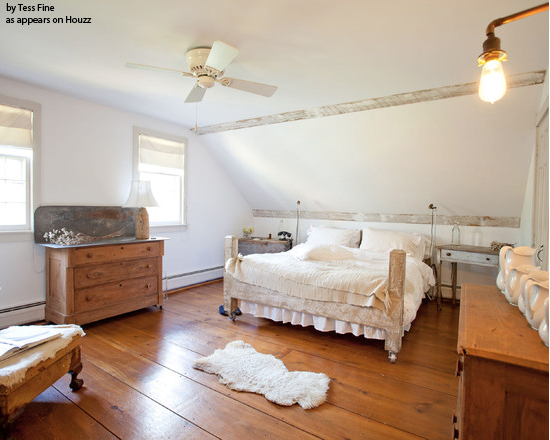 If you don’t have the budget to redo your entire bedroom this spring, don’t worry. 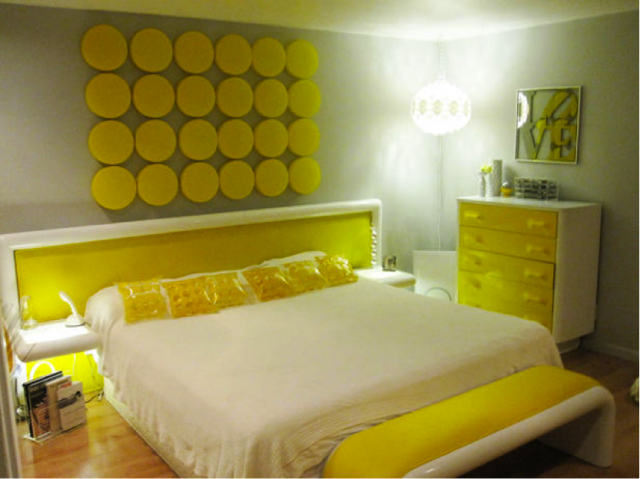 There are a number of ways you can dramatically change the look of your room without spending much time or money. An easy way to update your bedroom this spring is to buy a new comforter, or comforter cover. Since the bed comforter is such a large piece of fabric that is prominently displayed in your bedroom, you’ll really get a lot of bang for your buck visually. Bonus points if you can find a new comforter that’s reversible! Lightweight comforters will also help keep you cooler in bed during the warm summer months, making this a very practical update. Are you planning any interior design projects this spring? Let us know how your project is going in the comments below. Albert Einstein once said, “Things should be made as simple as possible, but not any simpler.” Take bacon and eggs, for example. 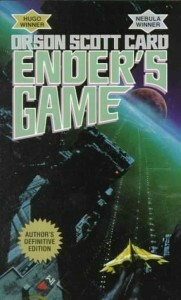 If you’ve ever eaten undercrisped bacon and overcooked eggs you’ll know what I mean. -Cook the bacon low and slow. On the evening prior, Kevin baked a Russet potato tossed with olive oil and sea salt. 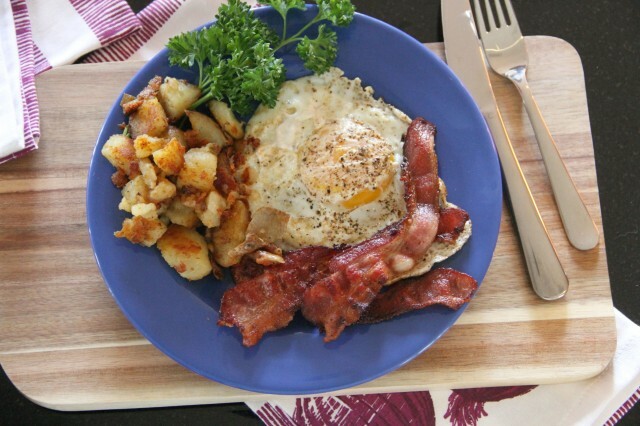 In the morning, he got his hash browns going, then started slow-cooking the applewood bacon. Kevin made sure to turn the thick slices several times, keeping them nicely coated with bacon fat as they edged toward a crisped brown. Finally, he cracked the eggs right on the rim of the oversized cast iron frying pan, quickly, then dropped them in one at a time leaving plenty of space between them. After frying the eggs for a minute or two, he gave them a final flip, then cooked them a few seconds longer to over-easy perfection. I helped him out by making some toast, and by savoring the absolute best kind of breakfast in bed imaginable – one made to order with love and care. For the hash browns, lightly spray a medium-sized heavy frying pan with cooking spray and place on stove over medium heat. Coarsely chop baked potato, skin on, and place in pan. Add a bit of olive oil, salt, pepper and paprika. Cook over medium heat, turning occasionally and adding additional oil as necessary, until potatoes are golden and crispy, about 10 to 12 minutes. When done, turn heat to very low and keep warm. Start the bacon right after the potatoes are seasoned. Spray a very large heavy frying pan with cooking spray and place over medium heat. 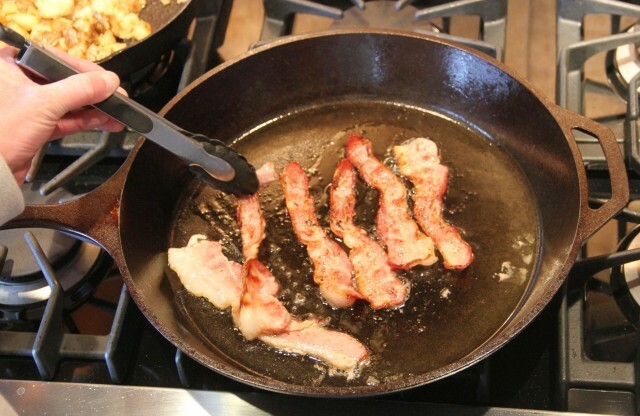 Add bacon and cook steadily over medium heat, turning each slice several times, until bacon is browned and crisp, about 10 to 12 minutes. Monitor heat as necessary to keep bacon cooking evenly. 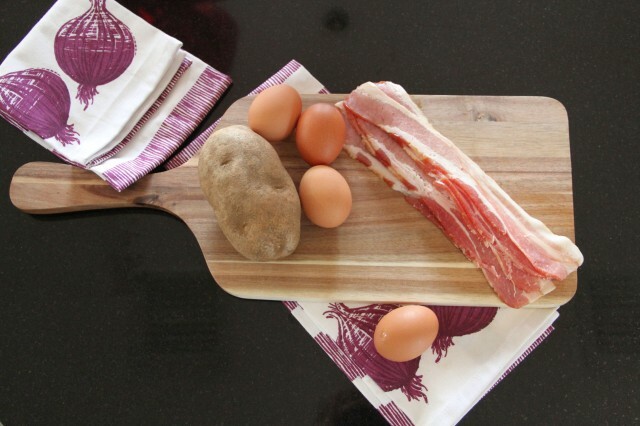 Let bacon drain on paper towels, and keep warm until eggs are cooked. 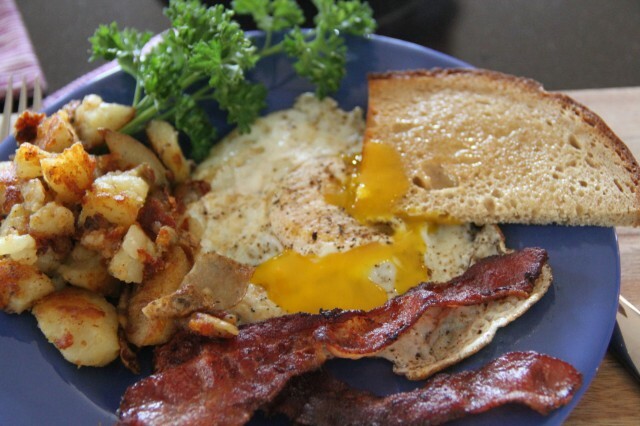 To make eggs, carefully remove excess bacon fat from frying pan, and place back over medium heat. 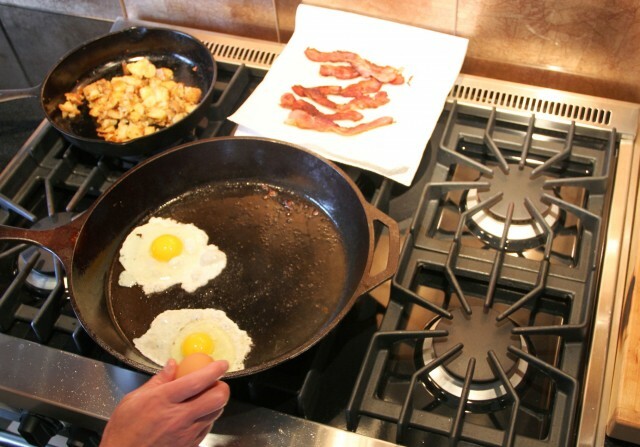 Crack eggs into pan one at a time, making sure to leave enough space between the eggs so the whites don’t run together. Season liberally with salt and pepper. Cook each egg until white is solid, about 2 minutes. Carefully flip egg and cook for another 30 seconds or so. Transfer eggs to plates and serve immediately.